Whirled Traveler: So what is Coffeeneuring anyway? I was recently made aware by a friend that I had neglected to explain the term, "coffeeneuring" fully. He assumed I had made it up and it was similar to canyoneering. While somebody did coin the term, I can't take the credit. It has origins in both Seattle and Washington, DC and ties into the sport of Randonneuring. Randonneuring, a little-known sport in cycling. It comes from the French and is basically long-distance cycling (100 to 1,000K) with lots and lots of rules. The main rule is that there is a time limit, within which all of your activities must be contained: cycling, eating, sleeping, peeing, etc. The "Randos", as they are referred to, love pedaling their bicycles and ride during the day and through the night, sometimes sleeping in phone booths or in the back of 7-Elevens (true stories from a rando friend). I once participated in a rando event called the Wine Country Populaire. It could be described as Rando Lite, as the distance was very manageable (100K – 60 miles) and we slept in beds at the end of the day. I think the organizers were just hoping to gain a few more recruits to head down the slippery road of randonneuring; something about riding these long distances makes them very, very nice people. Almost too nice. Back to the subject at hand... these rando people sometimes like to take it easy, if you can imagine that. They ride over hill and dale through the day and night, but then tootle down the street (still on their bikes, of course) to a coffee shop to perk themselves up. That is where Coffeeneuring was born – what randonneurs do when they're not out completing their bajillion-mile rides. Joe Platzner, a Seattle Randonneur, was quoted as saying, "A bunch of us have trained pretty hard for PBP (Paris-Brest-Paris). After PBP, I'm probably going to lobby RUSA for an official "Coffee Shop Run" medal. To earn it, you need to ride your bike slowly to a nearby coffee shop and enjoy a fine beverage." Shortly thereafter, a randonneur in DC coined the term "Coffeeneur". 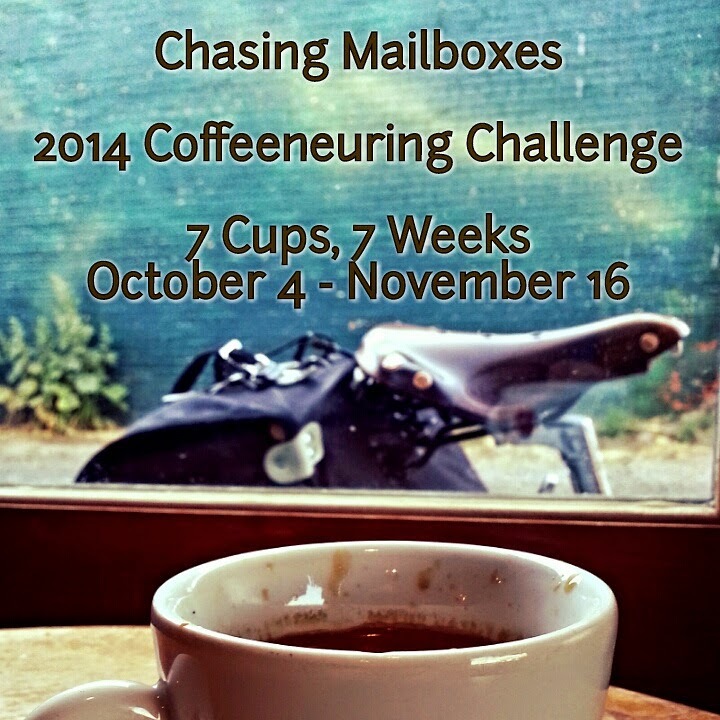 Of course, Coffeeneuring has rules, too, though not nearly as stringent as the Rando version. Plus, there's a commemorative patch for all my hard work at the end, which is produced the the author of Chasing Mailboxes.